(Dataquick) -- The number of homes sold in the Phoenix region in August rose slightly from July but fell short of the year-ago level as a burst of activity in the middle price ranges failed to compensate for another sharp drop in sub-$200,000 transactions. The median sale price edged higher again amid the ongoing shift toward more move-up buying and fewer foreclosure resales, which accounted for less than one in five deals for the second consecutive month, a real estate information service reported. In August, buyers paid a median $154,119 for all new and resale houses and condos sold in the combined Maricopa-Pinal counties metro area. That was up 2.7 percent from July and up 30.2 percent from August 2011, marking the ninth consecutive month with a year-over-year gain, according to San Diego-based DataQuick. The company tracks real estate trends nationally via public property records. The 30.2 percent year-over-year increase in the August median sale price followed annual gains of between 7.5 percent and 25.0 percent since last December. The August median was 41.6 percent below the Phoenix area's all-time peak of $264,100 in June 2006, but it was 30.2 percent higher than the median’s post-peak trough of $118,347 in August 2011. Last month's median was the highest for any month since the median was $162,984 in November 2008. The large year-over-year gains in the median sale price in recent months reflect several trends. Prices have risen as affordability-driven demand has met a relatively low supply of homes for sale. But there's also been a sizeable shift in the types of homes selling this year compared with last. More are higher-cost move-up homes and fewer are lower-cost foreclosed properties. If lenders eventually move more aggressively to clear their backlogs of distressed properties, then the inventory of homes on the market would rise, creating downward pressure on home prices. Regardless, if demand remains high and prices continue to edge higher, the market will eventually respond with a greater supply of homes for sale, which would tame price appreciation. More would-be sellers who've so far been reluctant to put their homes on the market will try to sell. Fewer people will owe more on their mortgages than their homes are worth, enabling them to sell. There will be more sales of newly built homes, which in August rose 43.3 percent from a year earlier, to the highest level for an August since 2008. A big drop in lender-owned properties on the market this year helps explain the lower inventory of homes for sale. Foreclosure resales, defined as homes that were foreclosed on in the prior 12 months, dipped to 19.3 percent of all homes that resold last month – the lowest for any month since January 2008, when it was 18.6 percent. August’s foreclosure resale level fell from 19.5 percent the month before and 47.6 percent a year earlier. At their peak in March 2009, foreclosure resales represented 66.2 percent of the Phoenix area's resale market. Last month a total of 9,179 new and resale houses and condos closed escrow in the two-county Phoenix region, up 2.2 percent from the month before and down 4.3 percent from a year earlier. The small movement in sales between July and August is typical for the season. On average, August home sales have changed 0.0 percent from July since 1994, when DataQuick’s complete Phoenix region statistics begin. Last month's total sales were 8.4 percent below average for the month of August. Resales of houses and condos combined were 5.2 percent higher than the historical average for August. Sales of newly built homes were 53.1 percent below average for an August. Among the region's larger communities, total home sales rose on a year-over-year basis in Buckeye (+1.7%), Gilbert (+26.7%), Glendale (+1.5%), Goodyear (+6.4%), and Tempe (+7.1%). Sales fell year-over-year in Maricopa (-0.4%), Mesa (-13.1%), Peoria (-4.7%), Phoenix (-1.3%), San Tan Valley (-13.2%), Scottsdale (-4.0%) and Surprise (-8.3%). Across the Phoenix region, sales continued to fall hard in the lowest price ranges. The number of new and resale homes that sold in August for less than $100,000 dropped 44.5 percent from a year earlier, while sub-$150,000 sales fell 27.6 percent. Deals between $200,000 and $400,000 rose 47.0 percent year-over-year, while sales above $500,000 rose 6.9 percent. Sales over $800,000 rose 11.7 percent from a year earlier. *A key price gauge analysts watch, the median price paid per square foot for existing single-family detached houses, was $85 in August, up from $83 in July and up 32.8 percent from a year earlier. The August figure was the highest since it was $92 in October 2008. The median paid per square foot has risen year-over-year for nine consecutive months. The August median paid per square foot stood 50.3 percent below the $171 peak in May and June of 2006. *At the county level in August, the median price paid per square foot for resale single-family detached houses in Maricopa County was $88, up 2.3 percent from the prior month and up 29.8 percent from a year earlier. It was the ninth consecutive month with a year-over-year gain. The Pinal County median paid per square foot was $63 last month, up 2.9 percent from the prior month and up 37.7 percent from a year earlier, marking the 11th consecutive month with a year-over-year gain. *Buyers with a foreign mailing address in the public record represented 3.1 percent of total Phoenix-area home sales in August, and 11.5 percent of condo resales. (Note: Not all foreign buyers use a foreign mailing address). 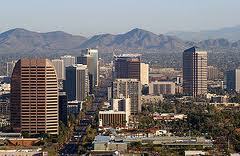 *Last month 14.8 percent of all homes sold in the Phoenix area were purchased by buyers based outside of the region. Of these out-of-region buyers, 26.0 percent were from California, while 8.6 percent were from Washington, 7.2 percent were from Arizona (outside of the Phoenix area), 6.4 percent were from Colorado and 4.5 percent were from Illinois. California buyers accounted for 3.8 percent of total Phoenix-area home sales in August. *Lenders foreclosed on 3,060 Phoenix-area houses and condo units last month, up 30.2 percent from the month before and down 25.0 percent from a year earlier. The number of homes lost to foreclosure between January and August this year totaled 19,998, down 49.5 percent from the same period last year. *Absentee buyers, who are mainly investors and vacation-home buyers, bought 39.7 percent of all Phoenix-area homes sold last month, down from 41.7 percent the month before and down from 44.0 percent a year earlier. The peak was 47.1 percent in March 2011. Last month, absentee buyers paid a median $119,000, up from $118,500 the month before and up 22.7 percent from $97,000 a year earlier. *Buyers paying cash bought 40.2 percent of all homes sold last month. That was down from 42.6 percent the prior month and down from 42.2 percent a year earlier. The record for cash buying was 48.0 percent in February 2011. Last month’s cash buyers paid a median $119,000, up from $117,000 the month before and up 40.0 percent from $85,000 a year earlier. *The market share for government-insured FHA home loans, a popular choice among first-time buyers, rose slightly in August to 27.0 percent of all home purchase loans. That was up from an FHA share of 26.1 percent the month before but down from 33.5 percent a year earlier.